​​An overweight, effeminate, average worker. That's something that I've seen or heard said on many occasion to describe Adrian Adonis. To which I normally can't even be bothered to reply...After all, they say ignorance is bliss, so why take away their bliss? If that is the opinion you hold of Mr. Adonis and you're happy believing that, feel free to stop reading. 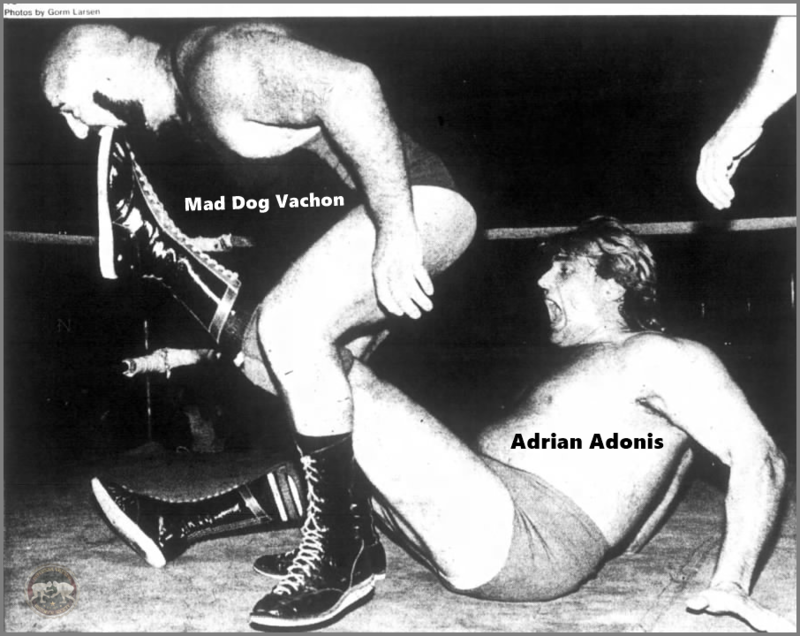 For those of you that would like to know why so many old school fans rate Mr. Adonis so highly on their lists of superstars who WWE misused or wasted, beyond his tragic death which always clouds one judgement when recalling someone, please read on. He was born Keith A. Franke and was born in Buffalo, New York. In late 1973/early 1974 Franke underwent training with Fred Atkins. Fred was known as a notoriously tough trainer in Canada. ""He said, 'Stamina is the most important thing in wrestling. If you have stamina, even if you don't wrestle that great, but you can take over if somebody tries to get smart. If you blow up, then the other guy is going to take over.' Stamina was his main key. He pushed me just to get in shape and train properly," Singh said. "We'd pull the ropes; he always believed in pulling, never lifting weights. He'd have a pulley on one side of the weights, and he'd ask, 'Just pull the ropes.' That's what his training was. That way you never get really big, but you get toned up. That's what he believed in."" "He had a mat in his basement, a horsehair mat and that was it, a mat on the concrete floor," recalled Patrick McMahon. "Amateurish stuff, it was real wrestling that we learned from Fred, you know what I mean? It wasn't the acrobatic stuff, it was the real stuff. It cost us when we started to wrestle because we were doing the real shoot wrestling. We were doing that and the other guys were surprised, and they didn't want to work with us because we were too rough with them." After reading them accounts of the place where Franke trained already it comes to light he must not have always been so out of shape. Truth of the matter is, Keith, was never slim, ripped up guy. But, he took on board what Fred Atkins told him and he always retained his stamina and that mental toughness that got him through the hard training sessions. It's noted his first match took place in 1974 under his real name of Keith Franke sometimes the surname would appear Franks. Naturally he traveled around Canada. There are appearances listed for him all the day down to Championship Wrestling from Florida, as well as the WWWF and MACW among other areas. It wouldn't take too long for Keith to find himself wearing gold. During the year of 1977 he won titles in NWA Hollywood Wrestling. The Americas Heavyweight Championship would find it's way around Keith's waist on May 13. He also picked up the Americas Tag-Team Championship on two occasions once with Black Gordman (April 25, 1977), and once with long term friend, Roddy Piper (July 22, 1977). In 1978 Keith rechristened himself Adrian Adonis. Soon after he'd be in Amarillo, Texas where he did the infamous wrestlers "Beat the Champ." challenge. It was said to be a straight affair and he legitimately took on members of the audience who thought they could defeat him. and earn the $1,000 reward. Adonis came up on the upper-hand every time as far is known in Texas, but then again, losses in this kind of situation often get swept under the mat. That was not the first territory Adrian had used that gimmick though. It was something he'd perfected over his years touring the North of America in various areas. There is still more though. Adrian earned the respect of his peers as both a wrestler and a bonafide tough guy in the first four years of his career. It would be in September 1979 that Adrian arrived in the AWA where he would form a tag-team that would see him at the very top of his career. That tag-team would be known as the East-West Connection. The partner would be Jesse 'The Body' Ventura. October 9 is the first match I have recorded for them. The duo quickly caught on, both men were excellent heels on the microphone. Adrian with his already formed tough guy biker-esque gimmick fit perfectly with Ventura. After going through the tag-team division in the AWA they'd be awarded with their version of the AWA World Tag-Team Championship on July 20, 1980. From there the East-West Connection were almost unstoppable. In many ways they were almost anti-hero, although people would never admit to liking them, but they had that certain quality that men secretly admired and women secretly wanted. This was backed up in the eyes of the viewing audience by them holding the gold for 329 days. The loss of the titles didn't harm the duo though and they remained red hot, arguably one of the most over tag-teams at the time. Riding the wave of success they headed to the WWF shortly after dropping the AWA World Tag-Team Championship to the High Flyers on June 14, 1981.